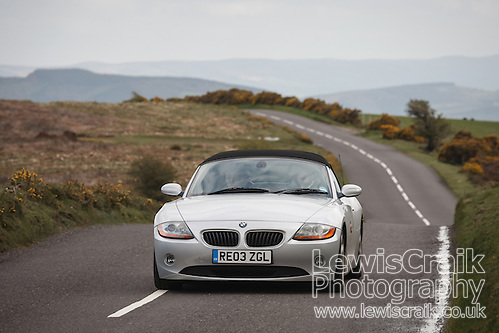 This is my friend Ali’s BMW Z4, the photo was captured near Porlock on Exmoor whilst we were on a road trip. A group of us were renting a house in Croyde, which I’d spotted last time I was there and after spending a week living in it, it is still my dream house. The plan had been to get a lot of surfing done, but mother nature had other ideas, and there weren’t any waves the whole time we were there. After being shown an article about the A39 on the Greatest Driving Roads website about how despite being named as a major road the A39 from Barnstaple to Minehead was in places just a single lane and had 1 in 4 gradient hills up onto Exmoor, a road trip was needed! Unfortunately, as we are taking my MX-5 to the Western Isles later in the year, I was driving Jen’s 500, Ali & his girlfriend, also called Jen, joined us in Ali’s Z4. The 500 coped surprisingly well with the hills and the views over Exmoor and over the Bristol channel to Wales were great, Minehead was less so, my advice to anyone doing this road trip would be to stop at Porlock, which seemed much nicer than Minehead and the last part of the A39 wasn’t anything special. On the return journey we stopped at the top of Porlock Hill and I asked Ali to drive the section of road a couple of times so I could take some photographs. I’m quite pleased with the final result, I’d wanted to capture the sort of image that is used in Evo magazine which I think I managed, the only thing I don’t like about the image is that the roof is up! After the photoshoot we went to Lynmouth for a cream tea and walk along the harbour, before heading back to Croyde. So even though we didn’t get to surf a road trip to Minehead was a great way to spend the day!